We hope you will join us at our inaugural Celebration Dinner on Tuesday, May 7, at the Brae Burn Country Club in Purchase, New York to help us celebrate Building Communities and Changing Lives in Westchester County and beyond. 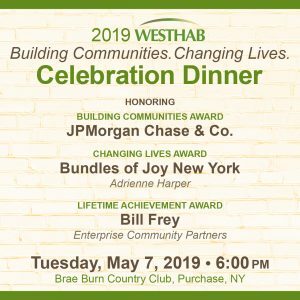 Bill Frey from Enterprise Community Partners will be honored with a Lifetime Achievement Award for his exceptional contribution to Westhab and to the affordable housing community. To purchase tickets or to explore journal opportunities, please click HERE. Erin Construction & Development Co., Inc.